Nike Mercurial Vapor – a cleat designed to deliver high-speed control and agile explosiveness for the attacking forward. Take your game to the next level of speed with a pair of Nike Mercurial Vapor cleats that are worn by top players including Cristiano Ronaldo, Neymar, and Eden Hazard. The latest version, the Mercurial Vapor X, is offered in both firm ground and indoor soccer shoes allowing players to play their best at top speeds. 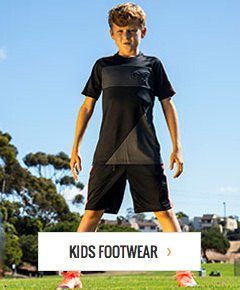 Shop from soccerloco’s selection of Merurial Vapor soccer cleats and shoes today. The Mercurial Vapor cleats we carry at soccerloco put forth some of Nike’s best design features to make them deadly fast and comfortable to boot. Bladed thermoplastic urethane cleats and footplates on every Mercurial Vapor soccer cleat allow you to dig into the ground and accelerate hard. Soft, Teijin leather is a durable synthetic material that is thin enough to give you a natural feel on the ball to help you control it during high-speed maneuvers. Inside of the Mercurial cleats, a perforated sockliner contours to the natural shape of your foot to keep you cool and comfortable on the field. Each shoe is designed to bring your game to the next level of performance and speed on both firm and soft natural surfaces. Shop for Nike Mercurial Vapors now at soccerloco and find the pair that’s right for you. Shop at soccerloco, the leading online retailer of soccer equipment and apparel, to take advantage of our great prices and frequent discounts. We’ve got you covered at soccerloco; with flat rate shipping to anywhere in the continental United States, your Vapors will make it to you without additional costs. Look through the large selection of Nike Mercurial soccer cleats we carry to find a cleat that calls to you. Save now on Mercurial Vapor soccer cleats by Nike at soccerloco and crank up the speed on your game.